Royal Court Jerwood Theatre Upstairs, London. The Royal Court’s International writing programme is still one that goes largely unsung and almost always undervalued. For nearly 20 years they’ve been scouring the world, running writing workshops and for at least seventeen of them, in Palestine. With Dalia Taha’s Fireworks, they’ve really struck gold. A novelist and poet (who was brought up in Ramallah though born in Berlin), Fireworks is the first production by a Palestinian playwright from the Royal Court’s International scheme. Despite its subject – inevitably sombre not to say agonising – of the effect on two families living under the siege of Ramallah in 2002, its tone turns out to be both wonderfully tender and humorous as well as shocking. Geopolitically, the subject is fraught with cultural danger. Two plays in the `noughties’ – My Name is Rachel and Caryl Churchill’s Seven Jewish Children –each set off firestorms of comment due to their perceived pro-Palestinian sympathies. Fireworks ostensibly falls into a similar category but such is the gentle universality of Taha’s writing, its war situation could as easily be applied to any other current war torn situation. Its style though has more in common with other Palestinian companies who have visited the UK in recent years being both surreal and absurdist despite the horrific context. Humour we know is the most potent of weapons in the face of horror and here Taha weaves a marvellous texture of play, fantasy, protectiveness and anguish as the parents of two teenagers, Khalil and Lubna struggle to keep up a sense of normality in a day-to-day existence determined by death and destruction. Richard Twyman’s production, set in one room criss-crossed by bare wires and light bulbs is an eloquent expression of the deprivation under which the families are living. But it is the playing together with Taha’s writing that makes Fireworks – euphemism for bombs – so delicately memorable. 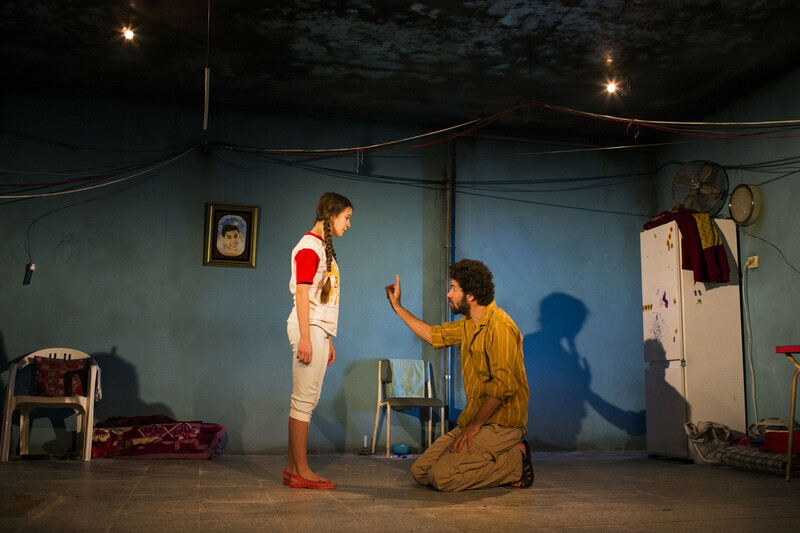 There are exquisite performances from Palestinian actor Saleh Bakri and Sirine Saba as the parents devastated by the loss of their little boy as well as by the two young actors – Eden Nathenson and George Karageorgis – as Lubna and Khalil whose childhood is as smashed as the buildings destroyed around them. This entry was posted in 2015, Reviews and tagged Dalia Taha, Palestine, Royal Court Theatre on February 23, 2015 by Carole Woddis.